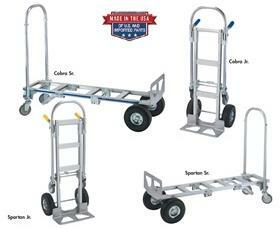 Use as a hand truck or a platform truck. Tough, durable and lightweight aluminum construction. Smooth and easy transition from the 2 to 4 wheel position. Features 18"W. noseplate for large load handling. 4 rivets per cross brace for extra strength. Welded release pedal. 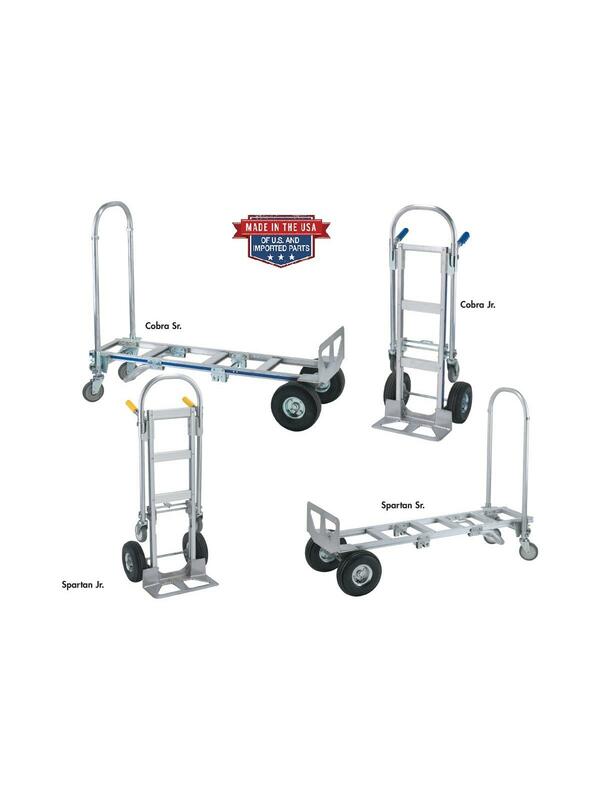 Platform casters are non-marking 5" x 1.25" swivel. Ships KD. FOB Shipping Point. Aluminum or steel surcharges may apply. Cobra Jr...Features dual hand grips for improved control. Includes 3 frame cross braces to help prevent package fall through. Cobra Sr...Continuous handle allows multiple ways to control loads. 4 frame cross braces to help prevent package fall through. Spartan Economy 2 in 1 Truck... Foot pedal release allows easy conversion from 2-wheel to 4-wheel position. 18"W. noseplate for large, bulky loads. Shipped KD in a box. Spartan Jr...Includes 3 frame cross braces to help prevent package fall through. Spartan Sr...Includes 5 frame cross braces to help prevent package fall through.